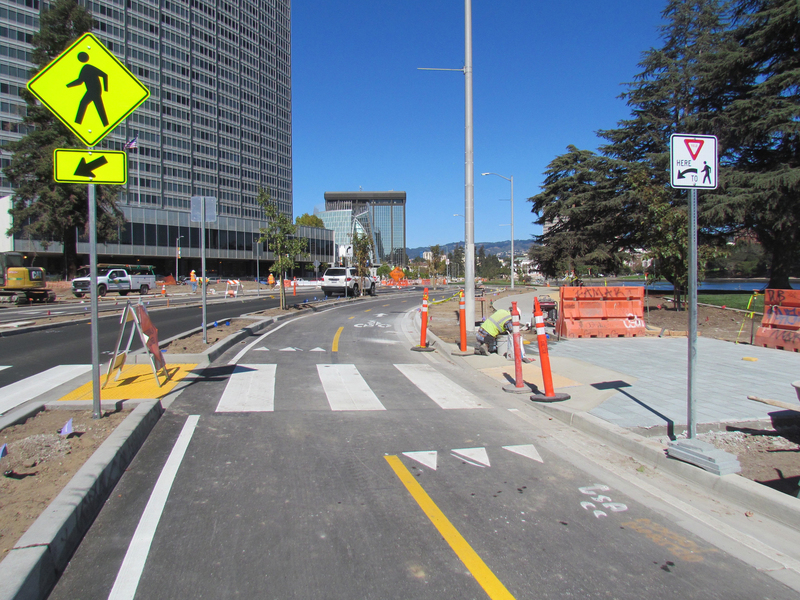 Oakland held a “soft” opening of what will be new protected bike lanes along with west side of Lake Merritt. The lanes are open but there has been no ribbon cutting or attention drawn to them because the project is not finished–and because getting to and from the north end of these lanes ranges from impossible to really not recommended except for very confident riders. But the one section that is open to traffic is a hint at how sweet this side of Lake Merritt will be to ride, scoot, and walk along (and drive, but whatever) once the project is complete. This section of Lakeside has for years felt like a mini-freeway, too wide and too easy for cars to speed along, and with too many lanes merging on both sides. There’s still a piece that remains that way—where the bike lanes end going north—and unfortunately until that part is complete it means bikes exiting these dream lanes are forced to mix with traffic in very narrow lanes–see photo below. But oh! Those bike lanes! Robert Prinz tweeted out this video of his ride along them on Friday. Wide, well-marked two-way lanes, a planted median separating bikes from traffic, a new wide sidewalk going in next to the current lakeside path, bike signals, pedestrian-only signal phases—what is not to like? And this really is only the beginning. These lanes are a small part of a much larger reworking of the area that will include enlarging Snow Park and extending it into what used to be a wide, fast, curving intersection. Where the street used to be, the project will build a pedestrian promenade with a magnificent view across the lake. There will be a new playground, art, even a new putting green. 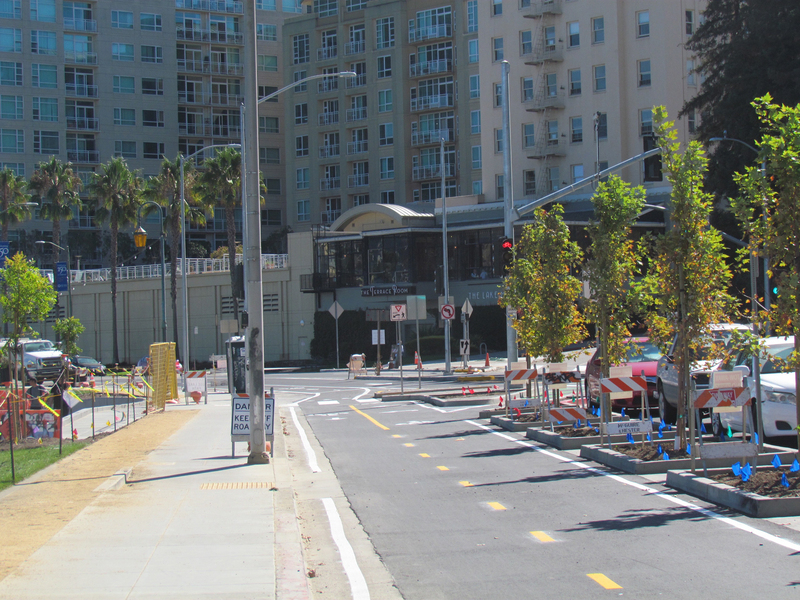 Trees will shade and protect the bike lane. In addition, one day the cycletrack will continue to the intersection of Grand and Harrison–which will become a protected intersection–and wrap around the lake to join the lanes on Grand. City staff are considering extending the protected bikeway further south when the area is repaved in 2019. 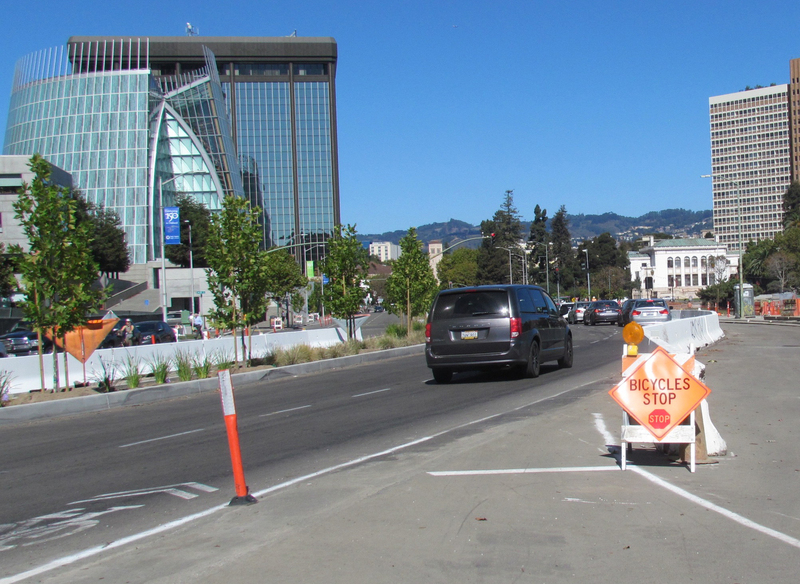 Plans are afoot to build protected bikeways on connecting streets throughout downtown Oakland. Prinz also points out, with appreciation, that the design work for the protected bike lanes was mostly carried out in-house—that is, by OakDOT staff, not consultants. That sounds like a wonky detail, but it’s important to note that having experienced city staffers is key to building better and safer bike infrastructure everywhere. They know what questions to ask, they know what obstacles need to be overcome, and they become champions for doing it the right way the first time. Oakland’s website still–understandably–tells people to stay away. There is still a lot of construction going on, and unless you want to ride back and forth on this one section—which a bike nerd like this editor would heartily applaud—the lanes don’t work for everyone just yet. There is still a lot of construction activity in the area. Bike riders have to merge with traffic in narrow lanes at the north end of the protected bicycle lane–for now. Looks good – nicely done, Oaktown!